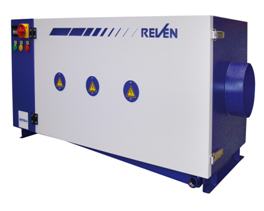 With the new Ultra Cleaner Elektro, Reven has developed an electrostatic separator that achieves highest seperator performance possible. A RXZ-High-Performance filter element is inserted as first filter stage. Smallest dust and suspended particles as well as smoke are separated from the exhaust by an electrostatic collector. The rest of the particles is additionaly arrested by an extra filter. The device has a solid housing of sheet steel, free of torsions. Its base is formed as an oil- and water resistant sump.